The team at Good George are good guys (and girls) so they have extended their popular Tuesday Kids Eat Free* offer throughout the week during the school holidays. Check out the menu here. Monday – Friday, 11am - 3pm across the school holidays. *Excluding public holidays, age limit 12. One child with every full paying adult. This is the ideal place for the kids to chill out during the hols. The cool American theme and great food make it good clean family fun. Turn the kids meal into a combo by adding dessert and juice for just $3! Or enjoy a creamy milkshake for only $5 – how good is that?! Let Italian Chef Andrea teach the kids how to cook so you can have a night off! In just two hours Andrea will teach them how to prepare pizza and pasta. *Minimum 8 kids per booking. Ages 6 - 14 years. *Age limit 12. One child with every full paying adult. 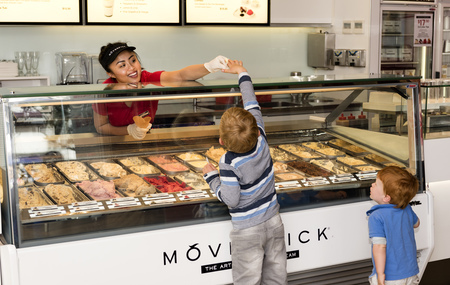 For a limited time only* these school holidays, head on down to Movenpick Mission Bay for an Easter special chocolate waffle cone.